Description: During the past several decades, family and household religion has become a topic of Old Testament scholarship in its own right, fed by what were initially three distinct approaches: the religious-historical approach, the gender-oriented approach, and the archaeological approach. The first pursues answers to questions of the commonality and difference between varieties of family religion and describes the household and family religions of Mesopotamia, Syria/Ugarit, Israel, Philistia, Egypt, Greece, and Rome. Gender-oriented approaches also contribute uniquely important insights to family and household religion. Pioneers of this sort of investigation show that, although women in ancient Israelite societies were very restricted in their participation in the official cult, there were familial rituals performed in domestic environments in which women played prominent roles, especially as related to fertility, childbirth, and food preparation. Archaeologists have worked to illuminate many aspects of this family religion as enacted by and related to the nuclear family unit and have found evidence that domestic cults were more important in Israel than has previously been understood. One might even conceive of every family as having actively partaken in ritual activities within its domestic environment. 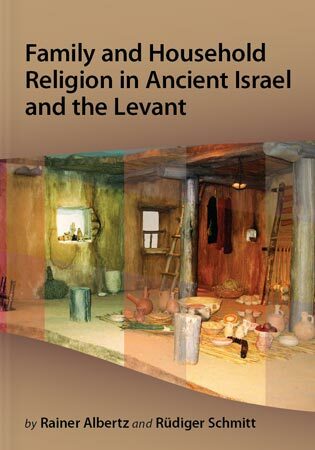 Family and Household Religion in Ancient Israel and the Levant analyzes the appropriateness of the combined term family and household religion and identifies the types of family that existed in ancient Israel on the basis of both literary and archaeological evidence. Comparative evidence from Iron Age Philistia, Transjordan, Syria, and Phoenicia is presented. This monumental book presents a typology of cult places that extends from domestic cults to local sanctuaries and state temples. It details family religious beliefs as expressed in the almost 3,000 individual Hebrew personal names that have so far been recorded in epigraphic and biblical material. The Hebrew onomasticon is further compared with 1,400 Ammonite, Moabite, Aramean, and Phoenician names. These data encompass the vast majority of known Hebrew personal names and a substantial sample of the names from surrounding cultures. In this impressive compilation of evidence, the authors describe the variety of rites performed by families at home, at a neighborhood shrine, or at work. Burial rituals and the ritual care for the dead are examined. A comprehensive bibliography, extensive appendixes, and several helpful indexes round out the masterful textual material to form a one-volume compendium that no scholar of ancient Israelite religion and archaeology can afford not to own. Citation: Raz Kletter, review of Rainer Albertz and R�diger Schmitt, Family and Household Religion in Ancient Israel and the Levant, Review of Biblical Literature [http://www.bookreviews.org] (2014).